Recently I was asked about our friend, Krista, that passed away and what qualities we most admired and learned from her. You can see her cheerful smile and loving parents on the cover of our new Mid-Willamette Valley guide. She was sensitive and thoughtful, but what came to mind was how "present" she always was. She never seemed rushed, hurried, or made you feel less important than her next task. Please note- she was ALWAYS late to EVERYTHING. In the months since she passed away, her lack of timelines has never been mentioned, but how she made everyone around her feel comes up daily. Ideally- I would like to be both on time and present- but I will need to schedule less to make that happen- starting now. My goal is to "Do Less- but Better"! With that comment, if you are going to go to just one event in October, it should be our Release Party on October 25th. We are expecting record attendance and this is the networking event of the year with 150 guests expected RSVP today. Feel free to invite your colleagues, referral sources and significant others. 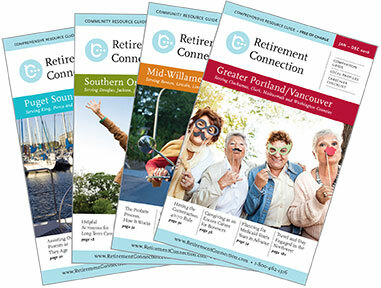 The newest edition of Retirement Connection for Mid Willamette Valley has hit the streets and we hope you join us to celebrate. 50,000 copies were printed and you can find them at every hospital, library, meal on wheels site, veteran office and hundreds of other locations. Topic: Are you trying to grow a tree in a flowerpot? Do you manage your schedule or does it manage you? I started my business 10 years ago with 2 toddlers because I wanted more time with family. But 3 years into the work, my 4 year old told me I was a bad mommy- and he was right. I was a good person, but not the most available parent. If someone looked only at your calendar and made a judgement based only on that- what appears to be your priority? It is never too late to make a change. Good luck!